If it’s running 5k, or walking to work a new way, a morning swim or just taking the bike for a spin – join the thousands of people around the UK kick-starting their 2019 in the most positive way. Join Dorset Mind’s RED January campaign and help us raise awareness and vital funds. How did you hear about RED January? We'd love to continue on the Dorset Mind journey with you. Happy to receive updates from the Dorset Mind team? You can purchase a RED January t-shirt for £10 once your application has been approved. A link to purchased will be attached in your confirmation email. Red January shoe laces will be given to successful applications. Stock is limited for both items and available on first-come-first served basis. 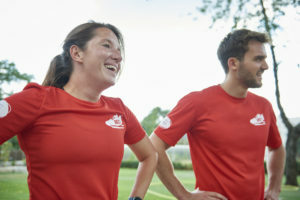 To set-up your RED January 2019 fundraising page for Dorset Mind, go onto JustGiving and visit the campaign page, select ‘Start Fundraising’ and you’re ready to set up your page. You will then be invited to set-up and customise your page, your way. If you need any more help with getting your page set-up, feel free to drop us an email at – redjanuary2019@dorsetmind.uk. We’re here to help.